It’s a great fashion accessory to complement your favorite casual outfit and bring a pop of color to your wardrobe. This triangle cowl crochet pattern is easy enough for advanced beginners and and trendy enough to delight anyone who receives on under the tree this year. Designed by Janet of Janknits Hooked, the Serenity Snood is going to go on your must-make list, for sure! Purchase the ad-free pattern for the Serenity Snood on Etsy. Bobble Stitch: Yarn over and go in the st 4X there should be 9 loops on the hook then pull through. Row 14: sl st into the ch1 space, ch 4 dc in the same st,*dc, ch1, dc in the next ch 1 space, dc, bubble st , dc in the next ch1 space, dc ch 1 dc in the next ch 1 space* repeat (2 V sts and a bobble) you’ll end with 2 V sts, go to the center and do and increase inside the chain one space and continue a V st in the next 2 ch 1 spaces, do a bobble sts in the next ch1 space and repeat, you’ll have 2 V sts before joining. Row 16: sl st to the ch1 space, ch4 do V sts throughout the whole row in all the ch1 spaces until you get to the center and do the increase continue with V sts until end of the row and join. Row 22: repeat row 14 before the increase you’ll have a bubble st, after the increase continue pattern with a bubble st, then 2 V sts, and a bubble st, repeat until end of row and join. Row 29: ch 2 go into the ch 1 space and do a sc, ch3, sc, sc between the two V sts, repeat all around and join. Cut your yarn weave in your end. For the cord with a smaller hook make a ch that’s about 38”. Then add it to your snood go in and out of every 2 sts on the first row leaving 3 sts in between the entrance and exit. I know you’re going to love making the Serenity Snood and I so look forward to seeing your finished product. Janet Martinez is an LA-based knit and crochet designer. Although she’s has worked with many different crafts, knitting and crochet is how she’s able to express herself and be more creative. She has been knitting and crocheting for around 14 years, it wasn’t until she became a stay at home mom where she was able to practice and perfect her skills and ideas. Janknits Hooked was created in 2016, when she finally decided to design and make things that reflected her style. Her designs have an alternative and grunge style that is inspired by what she wears and loves. I hope you found the information you were looking for. 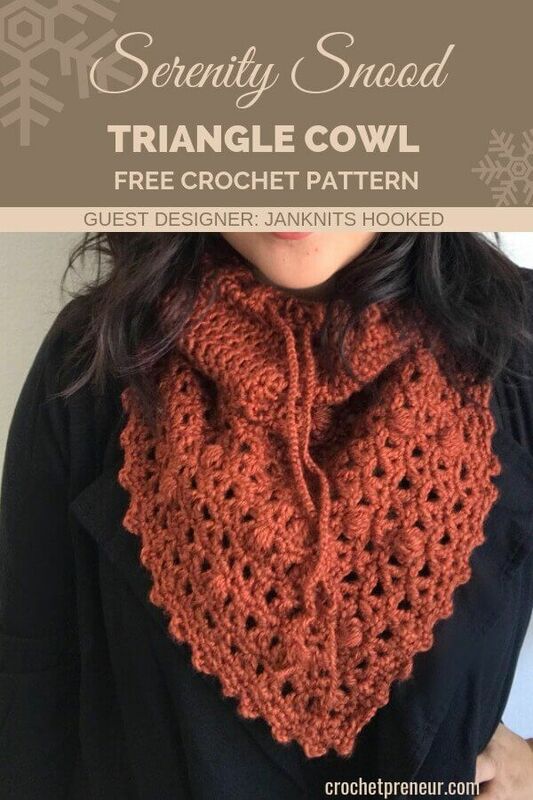 At the bottom of this triangle cowl pattern, it has a link to the designer’s website and social media accounts. Her business name is JanKnits Crochet. Since this is a guest designer’s pattern, I haven’t worked it up so I don’t have a good answer for you. I’m so sorry! I hope you were able to work thought it!